NETWORK FINALS: OLYMPICS coverage adjusted up by 0.1 to 9.1 in final numbers. In addition, BIG BROTHER gained 0.1. CABLE HIGHLIGHTS: POWER again put Starz at the top of Sunday cable, even though it fell 0.11 to 0.78, with SURVIVOR’S REMORSE down a much more serious 0.22 to 0.25. On HBO, BALLERS led the line-up, down 0.06 to 0.54, with THE NIGHT OF down 0.03 to 0.47, LAST WEEK TONIGHT down 0.14 to 0.39, and VICE PRINCIPALS down 0.09 to 0.33. At Showtime, RAY DONOVAN fell 0.07 to 0.26, and ROADIES reversed the tide, up 0.04 to 0.10. On Adult Swim, SQUIDBILLIES dropped 0.06 to 0.54, and BRAD NEELY’S HARG NALLIN lost 0.02 to 0.47. USA’s MOTIVE fell 0.04 to 0.14. TV Land’s THE JIM GAFFIGAN SHOW rose 0.02 to 0.13. CMT’s STILL THE KING lost a tick to 0.06. The unscripted side was led by USA’s NASCAR race at 0.75. 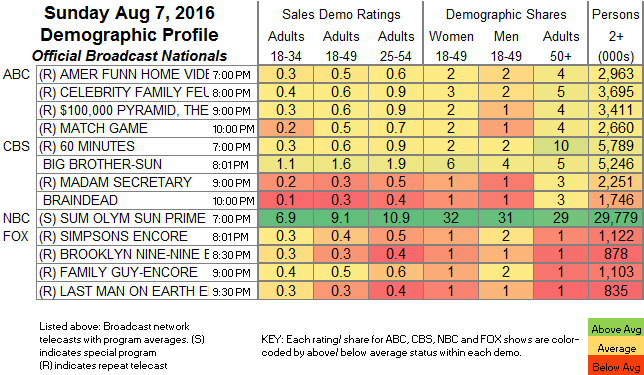 Discovery’s NAKED & AFRAID fell 0.15 to 0.61. 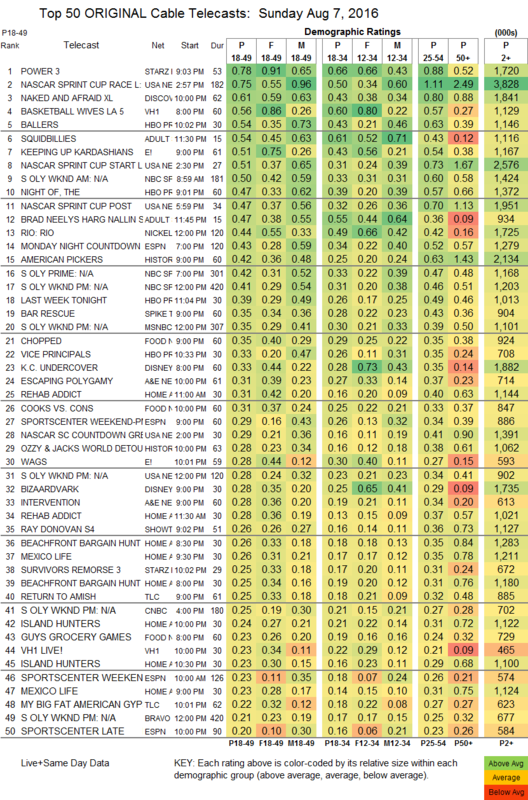 VH1’s BASKETBALL WIVES ticked up to 0.56. On E!, KEEPING UP WITH THE KARDASHIANS took a two-tenths hit to 0.51, and WAGS was down a much more moderate 0.02 to 0.28. NBC Sports Net’s portion of OLYMPICS coverage peaked at 0.50, with MSNBC at 0.35, USA at 0.28, CNBC at 0.25, and Bravo at 0.20. History’s AMERICAN PICKERS edged down 0.02 to 0.42, and OZZIE & JACK’S WORLD DETOUR was down 0.04 to 0.28. Spike’s BAR RESCUE dropped 0.09 to 0.35. On Food Network, CHOPPED was at 0.35, COOKS VS CONS took a 0.15 hit to 0.31, and GUY’S GROCERY GAMES was down 0.09 to 0.23. A&E’s ESCAPING POLYGAMY was down 0.02 to 0.31, and INTERVENTION ticked down to 0.28. TLC’s RETURN TO AMISH dropped 0.09 to 0.25, and MY BIG FAT AMERICAN GYPSY WEDDING was down 0.02 to 0.22.